Jenny has never been normal if her palm happens to graze someone else then there is the chance that she will glimpse one of their past lives. After a strange incident with a Ouija board. Jenny befriends Ben and through an old music box she discovers her own past life in Romanov Russia. 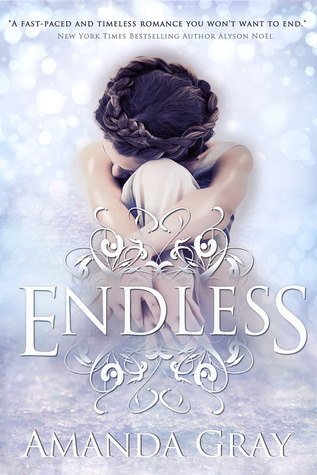 What I liked most about Endless was that is was a fast paced read. There was always some action driving the plot forward. I am a big believer in past lives so I was intrigued by the past lives in the story. I was also curious about Jenny’s mother who passed away, and the love story between Jenny and Nikolai. The romance while it was supposed to be this epic love affair that transcends time felt a little fragile and almost fake. Maybe it was because I was introduced to Ben first but I never really warmed up to Nikolai, and I actually found myself distrusting him while Jenny was falling all over herself to be in love with Nikolai. Luckily that was the only gripe I had with the story. The supporting characters including Jenny’s Dad, Ben’s Mother, and Jenny’s BFF all shined. My favorite interactions were between Jenny and her Dad. They are close especially after Jenny loses her mother at a young age. I liked seeing a positive father daughter relationship in YA lit. As I said above I was unable to fully embrace Nikolai because I liked the relationship that developed between Ben and Jenny. They have a lot in common both of them lost parents, and have always stood apart from others because they are different. I was rooting for them whether their relationship remains just friends or something more. Overall, Endless was a fun read that was infused with a good dose of history and intrigue. At the end of the novel there were some loose ends though and I’m excited to see what happens next for all of these characters. I love the review of this book! It was awesome! I most definitely want to read this book now.... I love anything with a bit of history, or even full history, now..... Definitely when it is mixed with a Fabulous YA storyline as well..... Hope I win! This sounds amazing! I am in need of a great book!